Welcome to Part Four of denkbots’ meta-analysis on combat robots: Historical Analysis of ComBot Fights! We will be building upon our analysis in Part One: Introduction to Robot Archetypes, Part Two: Analysis of Championship Fights, and Part Three: Comprehensive Analysis of ComBot Fights so take a moment to review if needed. Like all historical periods the start and end points are general signposts during times of transition and are more for data analysis than social commentary. We will begin this analysis at the genesis of robot combat: Robot Wars. As we saw in Part Two, this period of robot combat was dominated by Biohazard, The Master, La Machine, and Blendo. During these initial years of robot combat the “OTHER” archetype held a large percentage of the field due to the trial and error nature of engineering presented by any new challenge. Anyone wanting to better understand the early history of robot combat should read Gearheads: The Turbulent Rise of Robotic Sports. To provide a short historical introduction, an excerpt from Wikipedia is provided below. Robot Wars was the brainchild of Marc Thorpe, a designer working for the LucasToys division of Lucasfilm. In 1992, Thorpe had the initial idea for robot combat sport after unsuccessfully attempting to create a radio-controlled vacuum cleaner. In 1994, Marc Thorpe created Robot Wars and held the first competition at the Fort Mason Center in San Francisco. Approximately one month prior to the event, Thorpe formed a partnership with New York-based record company Sm:)e Communications, later Profile Records, who provided additional funding. Between 1995 and 1997, three further Robot Wars events took place in America and, in 1995, Profile Records partnered with production company Mentorn to produce and televise a Robot Wars event in the UK. 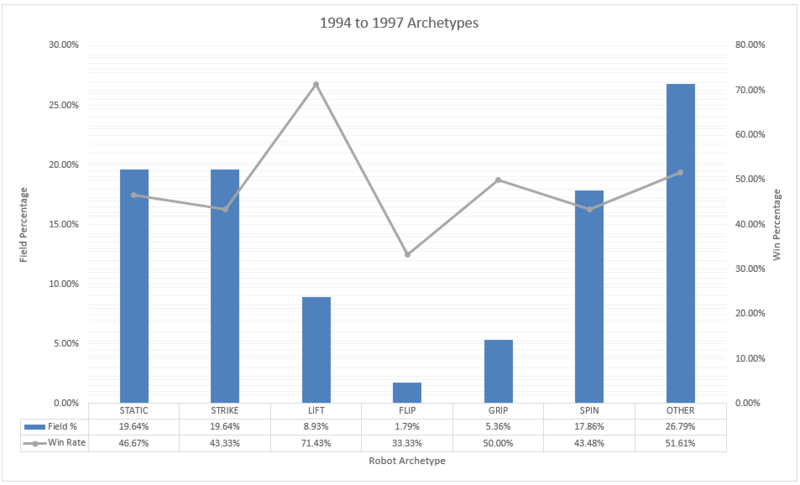 To begin our analysis from the previous data table referenced in Part Three, each archetype’s Field Percentage and Win Rate for the time period 1994 to 1997 was calculated. Below is an overview of the results for all collected match data during the given time period which is comprised of 4 Events, 74 Matches, and 56 Bots. As we did in Part Three, the representation of a given sub-type within each archetype (“Archetype Percentage”) and the win rate (“Win Percentage”) was calculated. Below is a summary of the results for collected match data from 1994 to 1997. Further building upon our analysis in Part Three, the archetype match-ups from the data table were tabulated. In the table below the archetype presented in the top row is the winner against the archetype in the corresponding column. Below is a summary of the meta-analysis for all collected match data from 1994 to 1997. To clarify the data above as we did in Part Three, the table below provides the win rate for each archetype match-up, highlights win rates above 60% in green, and highlights win rates below 40% in red. This period of robot combat, which includes the initial seasons of BattleBots, was dominated by Biohazard, Vlad the Impaler, Son of Whyachi, and OverKill. During these formative years of robot combat the “SPIN” archetype held a large percentage of the field due to its highly destructive potential. Anyone wanting to better understand the background of this period should read An Oral History of the Birth and Death of BattleBots. To provide a brief historical perspective, an excerpt from Wikipedia is provided below. BattleBots is an offshoot of the original American version of Robot Wars, the brainchild of Marc Thorpe. Robot Wars had financial backing from SME communications, a New York record company. The Thorpe/SME partnership broke up in 1997, starting many years of legal wrangling between Thorpe and Profile Records (the former SME Communications). Profile licensed Robot Wars to a UK production company and Robot Wars ran for seven years as a popular television program in the UK. 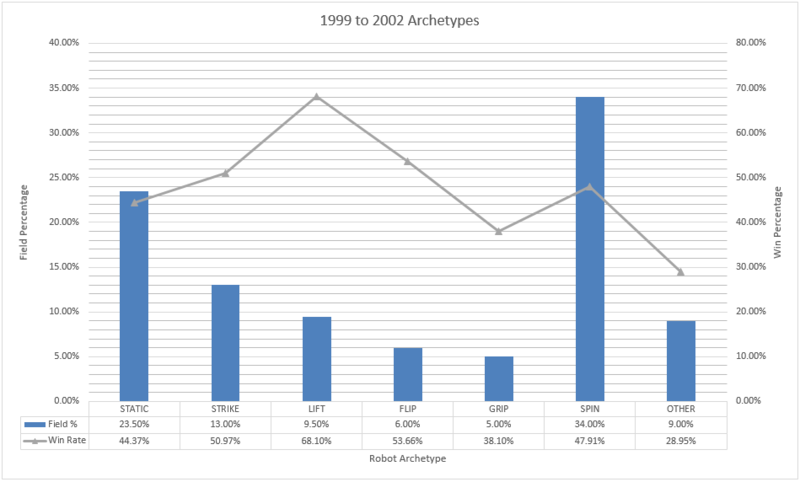 Returning to our analysis, each archetype’s Field Percentage and Win Rate for the time period 1999 to 2002 was calculated. Below is an overview of the results for all collected match data during the given time period which is comprised of 8 Events, 388 Matches, and 200 Bots. 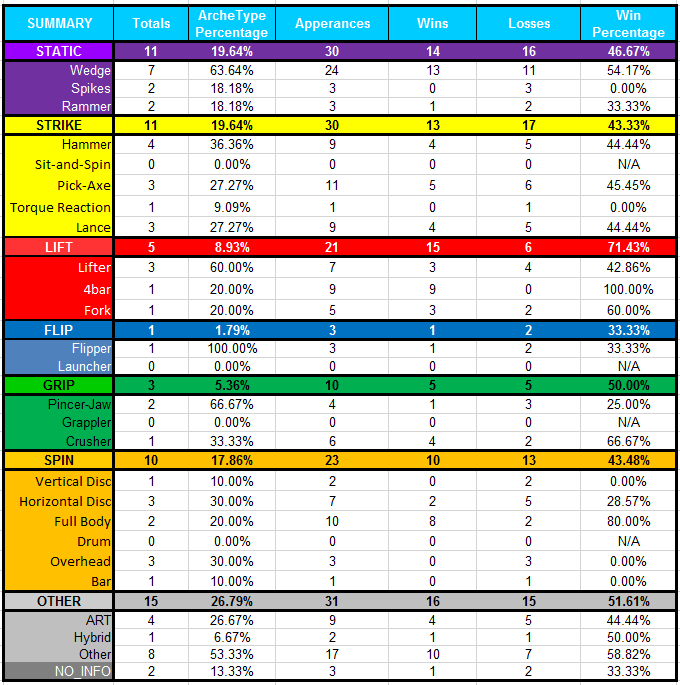 Expanding the above analysis, the representation of a given sub-type within each archetype (“Archetype Percentage”) and the win rate (“Win Percentage”) was calculated. Below is a summary of the results for collected match data from 1999 to 2002. Furthering the analysis, the archetype match-ups from the data table were tabulated. In the table below the archetype presented in the top row is the winner against the archetype in the corresponding column. Below is a summary of the meta-analysis for all collected match data from 1999 to 2002. To clarify the data above, the table below provides the win rate for each archetype match-up, highlights win rates above 60% in green, and highlights win rates below 40% in red. This period of robot combat, which includes the birth of the Robot Fighting League, was dominated by Sewer Snake, SJ, Shrederator, and Karcas 2. During these prime years of robot combat the “SPIN” archetype continued to hold a large percentage of the field, while the “STRIKE” archetype saw a sharp decline in numbers. To provide a historical perspective, an excerpt from Wikipedia is provided below. Steel Conflict, based in Southern California hosted seven events from 2002 to 2004. Steel Conflict was sold in whole in 2005, and the name was changed to ComBots. It should also be noted that Robot Combat was first included as an event at the ROBOlympics (which later changed its name to RoboGames) in 2004 in San Francisco, with competitors from across the world. 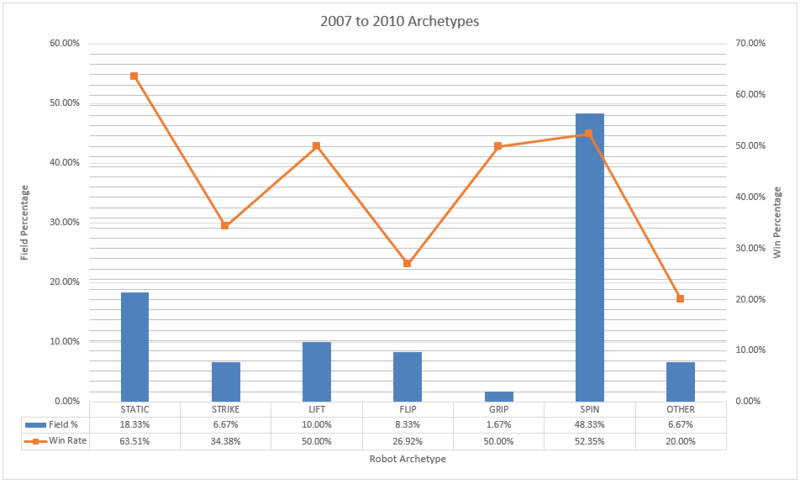 As we did in the previous section, each archetype’s Field Percentage and Win Rate for the time period 2003 to 2006 was calculated. Below is an overview of the results for all collected match data during the given time period which is comprised of 28 Events, 473 Matches, and 130 Bots. 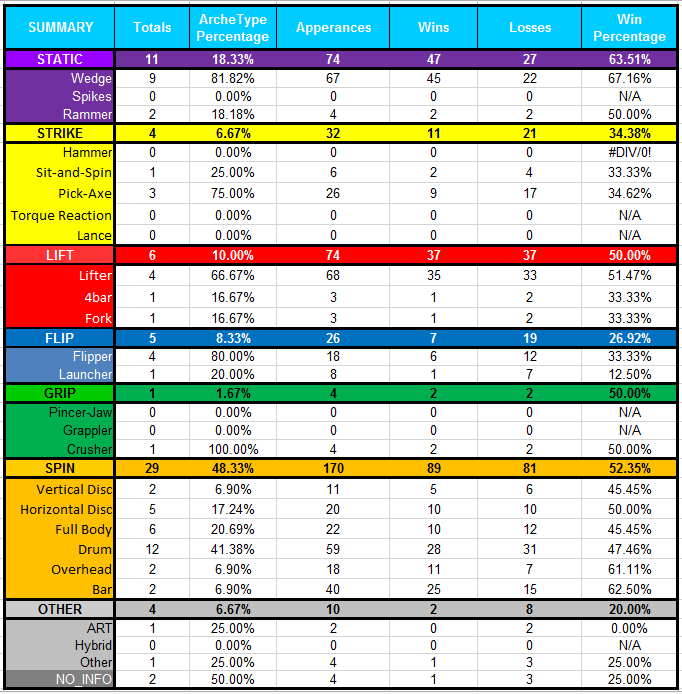 Expanding the above analysis, the representation of a given sub-type within each archetype (“Archetype Percentage”) and the win rate (“Win Percentage”) was calculated. Below is a summary of the results for collected match data from 2003 to 2006. Furthering the analysis, the archetype match-ups from the data table were tabulated. In the table below the archetype presented in the top row is the winner against the archetype in the corresponding column. Below is a summary of the meta-analysis for all collected match data from 2003 to 2006. This period of robot combat, which includes the Great Recession in the United States, was dominated by Original Sin, Sewer Snake, Last Rites, and Brutality. 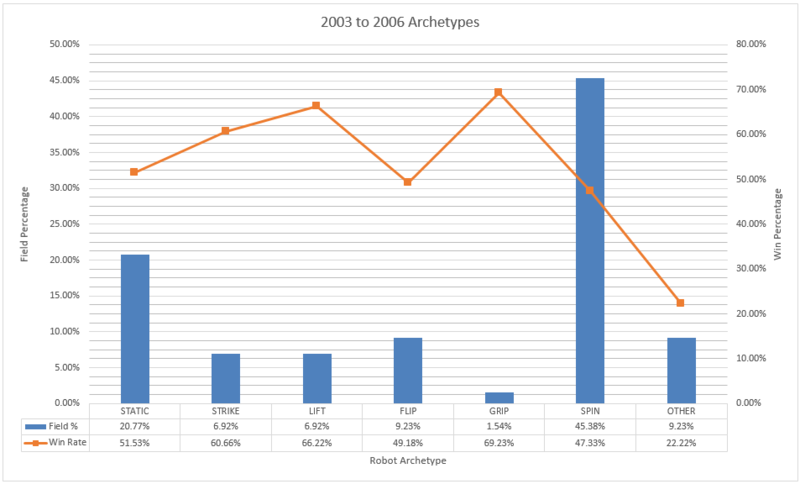 During these trying years of robot combat the “SPIN” archetype sustained its hold on a large percentage of the field, while the “STATIC” archetype saw a dramatic rise in win rate. To provide a short historical background, an excerpt from Wikipedia is provided below. In 2007, ComBots purchased the combat arena and all other assets from MMER (Minnesota Manufacturing Educational Resource). ComBots produced more than 30 robot combat events and was the US’s largest organizer of combat robot events. During this period, the majority of events were facilitated by ComBots and RoboGames. Continuing our historical analysis, each archetype’s Field Percentage and Win Rate for the time period 2007 to 2010 was calculated. Below is an overview of the results for all collected match data during the given time period which is comprised of 12 Events, 195 Matches, and 60 Bots. Expanding the above analysis, the representation of a given sub-type within each archetype (“Archetype Percentage”) and the win rate (“Win Percentage”) was calculated. Below is a summary of the results for collected match data from 2007 to 2010. 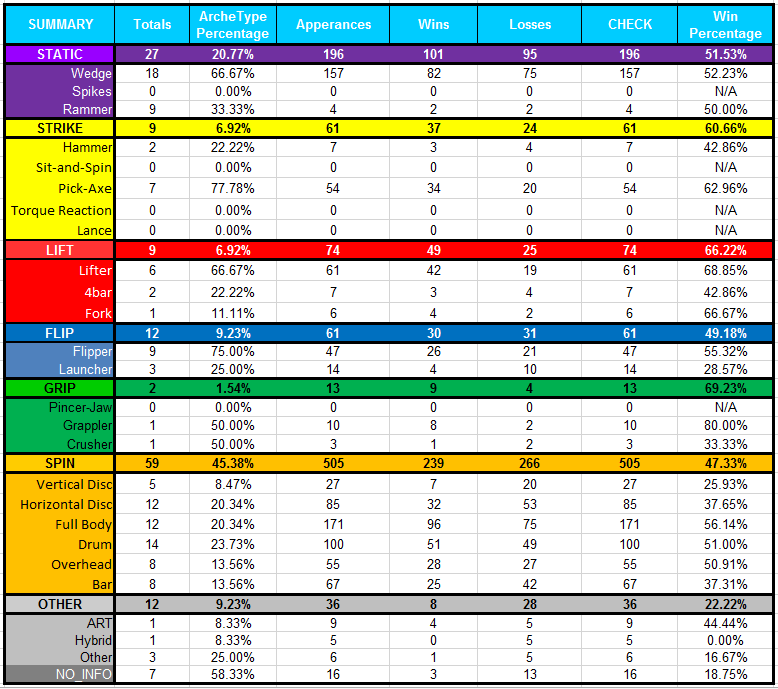 Furthering the analysis, the archetype match-ups from the data table were tabulated. In the table below the archetype presented in the top row is the winner against the archetype in the corresponding column. Below is a summary of the meta-analysis for all collected match data from 2007 to 2010. This period of robot combat, which ends with the return of BattleBots, was dominated by Original Sin, Sewer Snake, Last Rites, and Touro Maximus. 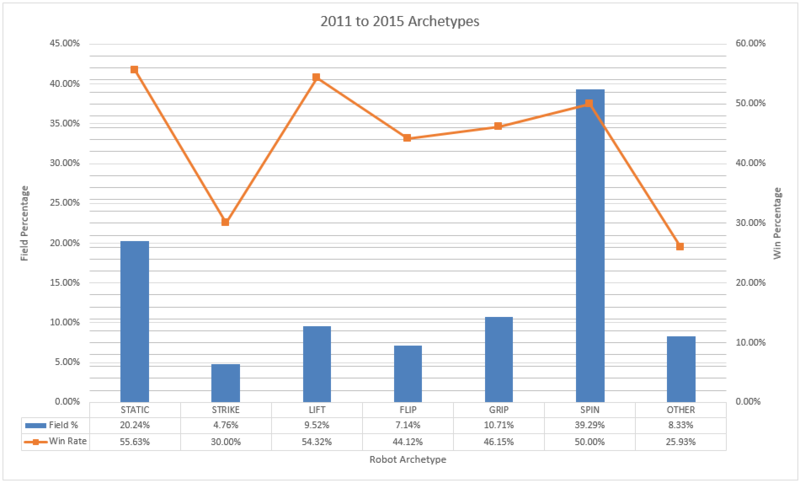 During these difficult years of robot combat the “SPIN” archetype remained the largest archetype by field percentage, while the “GRIP” archetype saw an establishing rise in representation. To provide a short brief historical perspective, an excerpt from Wikipedia is provided below. As of April 22, 2013 ComBots no longer produces robot events. During this period, RoboGames failed to hold an event in 2014 – ending its nearly decade long streak of yearly events. To finish our analysis, each archetype’s Field Percentage and Win Rate for the time period 2011 to 2015 was calculated. Below is an overview of the results for all collected match data during the given time period which is comprised of 8 Events. 242 Matches. and 84 Bots. 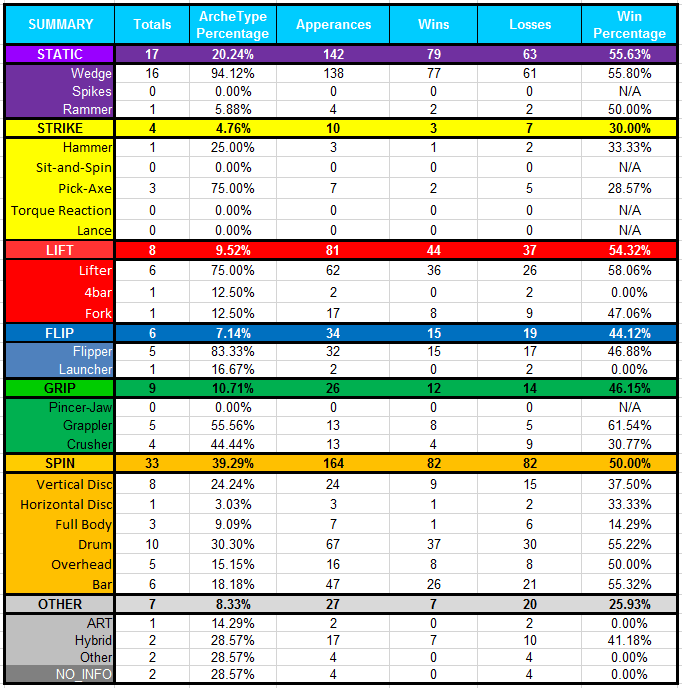 Expanding the above analysis, the representation of a given sub-type within each archetype (“Archetype Percentage”) and the win rate (“Win Percentage”) was calculated. Below is a summary of the results for collected match data from 2011 to 2015. Furthering the analysis, the archetype match-ups from the data table were tabulated. In the table below the archetype presented in the top row is the winner against the archetype in the corresponding column. Below is a summary of the meta-analysis for all collected match data from 2011 to 2015. With the return of BattleBots in 2015, the door has been opened for new heavyweight events and builders across the world have been inspired to build robots to compete in these events. Along with the renewal of BattleBots for a second season and the continuation of RoboGames into 2016, the Southeast Combot Championship has been scheduled for April 2016 and there are rumors of a return of MechWars this year. While we don’t like to make predictions, given the frequency of events that occurred after the initial run of BattleBots it would not be out of line to assume an upward trend in the number of events and new bots entering the field in the coming years. Given the advancements in technology over the last two decades and the innovation brought by new eyes on a problem, we are looking forward to new and novel solutions to this most primal of all problems: Combat. This was a lot of data: Take some time, review it, draw your own conclusions, and let us know what you think in the comments below. As we mentioned in Part Three, while there are many takeaways hiding in the data above, we will save that discussion for a later article. If there is another angle you would like us to take as we further our analysis, don’t be shy, let us know! Also, if you see an irregularities in the data, formatting, or presentation leave a note and we will correct it. In our next article we will analyze match-ups by sub-type, giving us very high resolution into our data set. As always, feel free to join the conversation on our Facebook or Twitter with your questions, thoughts, and feedback on these articles! Also, we have enabled comments now, so please feel free to leave your additions, corrections, and musings below!